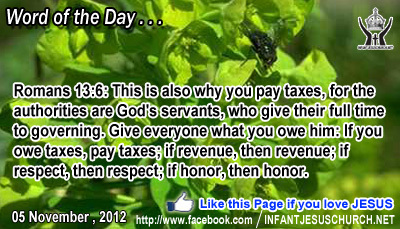 Romans 13:6: This is also why you pay taxes, for the authorities are God's servants, who give their full time to governing. Give everyone what you owe him: If you owe taxes, pay taxes; if revenue, then revenue; if respect, then respect; if honor, then honor. Heavenly Father, we pledge our allegiance to you, You alone are Sovereign, Ruler, and King. Because you call us to honor our government, because you have so richly blessed us to be in a land such as this, because you have lavished your grace on us so richly, we commit to live today in a way that honors our allegiance to you, our citizenship in our country, and our respect toward those whom we meet this day. In Infant Jesus' name we pray. Amen. Jesus searches our hearts as well. Do we show favor and generosity to those who will repay us in kind? What about those who do not have the means to repay you – the poor, the sick, and the disadvantaged? Generosity demands a measure of unselfishness. It doesn't impoverish, but rather enriches the soul of the contributor True generosity springs from a heart full of compassion and mercy. God loved us first, and our love is an answer of gratitude to his great mercy and kindness towards us. We cannot give God in his bounteousness towards us. Do we give freely as Jesus gives without hope for personal gain or reward? Loving Infant Jesus, fill us with gratitude for your unbounded love and mercy towards us. And purify our love for others that we may seek their good rather than our own benefit or gain. Free us to love others as you love.